Today, the village of Bil’in has marked 13 years of popular struggle against Israel’s apartheid Wall and its regime of apartheid, colonialism and occupation. Activists have staged a mass protest challenging the Wall on its lands and calling for BDS. At noon time around one thousand Palestinian and international activists gathered in a protest called for by the Popular Struggle Coordination Committee and supported by the Stop the Wall Campaign. 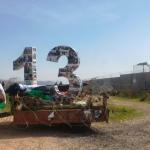 The crowd brought a tractor carrying a big sign marking 13 years since the first popular protest was organised in the village to resist Israel’s construction of the apartheid Wall on their lands. Since then, every Friday protests have been held. The wall in the area has been targeted and pieces of it torn down several times. The village has faced many campaigns of collective punishment, many of its youth have been arrested and injured. Activists have been killed. Today, the protest reached the Wall and activists climbed on top to put up a Palestinian flag - underlining they are the rightful owners of the land on sides. Activists left messages calling for Boycotts, Divestment and Sanctions - BDS - at the Wall. Balloons were sent into the air while Israeli military attacked the protest with tear gas and rubber coated bullets. Four people were injured, including one journalist and one international activist was detained by Israeli military forces. Bil’in’s protest today is yet another sign to the Israeli occupation forces that Palestinian resistance will not stop as long as Palestinians have not gained freedom, justice and equality and the Israeli apartheid regime continues to oppress and dispossess them. No repression will be strong enough to stop the Palestinian quest for self-determination.